If I were getting married at that time I would have found this book quite terrifying. 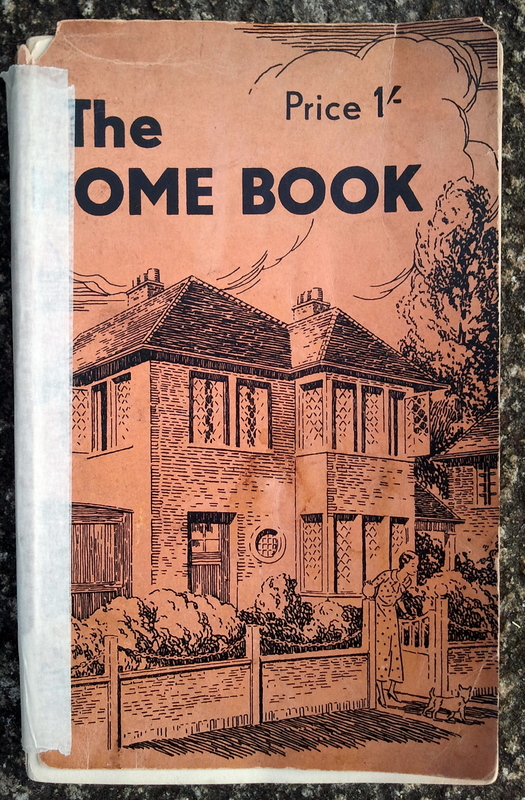 It’s edited by a Mrs D D Cottington-Taylor, who was not only the Director of the Good Housekeeping Insitute, but had First Class Diplomas in Cookery, Laundrywork, Housewifery etc etc. As a rookie housewife I would have quaked in my shoes. It has the air of a text-book, and would have taken weeks, if not months, for the poor woman reader to have digested all the information contained therein. Although there is still some useful advice, much of it seems quaint now: how to equip a small home laundry – (the importance of starching table linen cannot be over-emphasised) – how to clean piano keys – (with lemon juice and whiting – do make sure it doesn’t get into the cracks) – orris-root is good for greasy hair. There are daily and weekly timetables – set out in quarter-hours – for both the mistress and the maid – at 9.45 every day the letter-box, porch and steps should be cleaned – and the windows and silver should be attended to on Tuesdays. The section on Gardening (by John A McNab) was of particular interest to me. It’s set out in monthly tasks, and concentrates on edible crops and some ornamentals including Gloxinias, which few people grow now (very 1930s). Most of the advice would still be applicable today. But there was no peace for our woman – in January she was expected to make a hot bed for early crops from layers of leaves and ‘stable litter’ which should be 3 feet deep, and turned several times. Much spraying of insecticide is required. And she should “use the hoe continuously” – though how she was expected to do this while polishing her letter box at 9.45 sharp I can’t quite fathom. It’s Tuesday today. I had better go and polish the silver. Hello, Ms. Burnfield. I was looking up blogs about gardening today and came across your site. I’ve just read several of your posts and wanted to say that I think your writing style is wonderful. Your posts are enjoyable to read. Thanks for bringing a smile to my face today with your stories of books, bunnies, cutter bees, and other gardening topics. Thanks, Rob. Summer is coming!